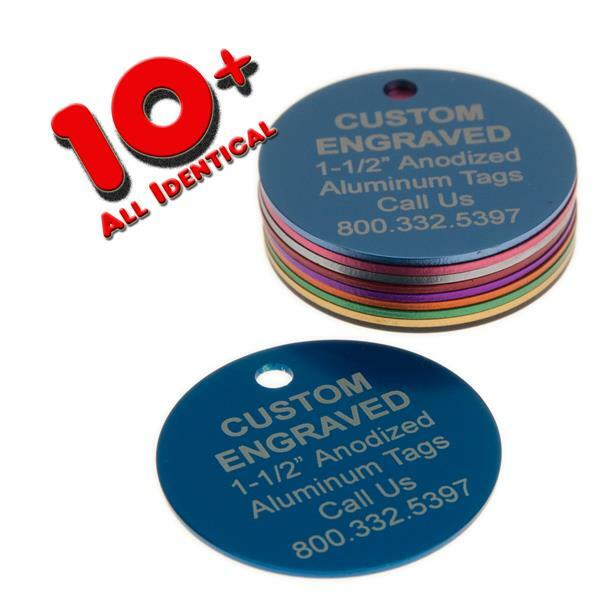 Tag Size: 1 1/2" Round and .050" Thick Anodized Aluminum. Price includes your personalized text or wording on FRONT side, up to 6 lines. Minimum 10 or more ALL IDENTICAL. Allow 3-5 Days Production Time..
You may also use SEQUENTIAL numbers (i.e. 1~10 ; 125~135) Enter range of numbers on line desired. Premium Aluminum Tag - Anodized Color wraps around the entire tag - No bare edges. Perfect for permanent identification of keys, valves, equipment and more. Maximum 6 Lines and 22 characters per line. Tags are 1 1/2" in diameter and .050" thick. The keyring hole is .150" in diameter. Max. 22 Characters per line..